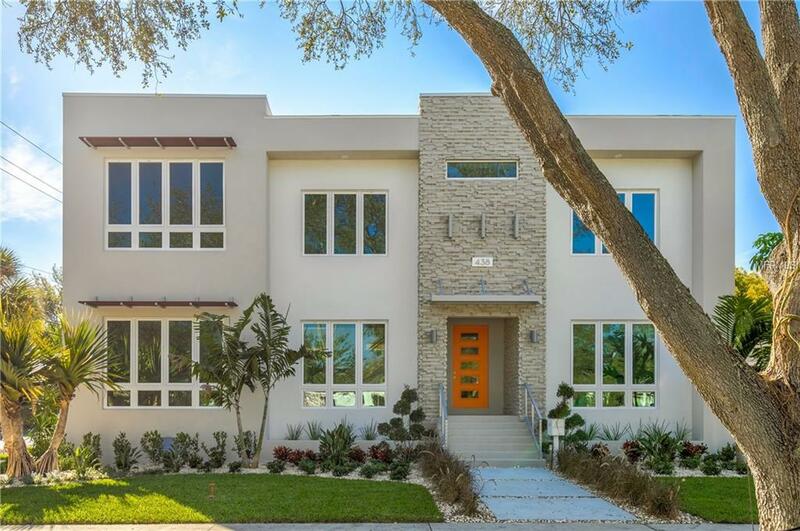 The creation of a master piece begins with VISION and ends with PERFECTION and that is just what South Tampa Luxury Builder Jim Clark has accomplished with his latest residence 438 East Davis Blvd. With clean lines, organic forms, superior open concept and conscious blend of materials, this Islands residents envelops the owner. This residence has clear sight lines from top to bottom, beginning with the floating steel cable staircase and continues with the wire brushed white oak HARDWOOD floors. The GOURMET kitchen is a designers dream, with Zodiac Cloud Quartz countertops, European style Wenge wood cabinets blended with white acrylic, large Cambria Torquay Quartz Island with waterfall, hidden paneled refrigerator and so much more. In line with the open concept the kitchen flows into the light filled GREAT ROOM with its 14 ft plus ceilings and expanded 16 ft wide glass sliding doors. The first level contains a formal DINING ROOM with butler pantry, family room, PRIVATE SUITE with full bath and additional guest half bath. The second level contains the master suite; with floating dual QUARTZ vanities, frameless shower and solid vessel SOAKING TUB. Additionally, this floor contains two additional guest bedrooms with two guest baths as well as the large 15 x 21 bonus room. The outdoors have a with unique roof top terrace with tv wall, storage closet and cedar arbor as well as a large OUTDOOR KITCHEN that includes gas grill, refrigerator and honed granite top with seating.